Since this is a homework problem I'll just give you few hints that hopefully help you to solve the problem yourself. You should know what linear and time-invariant mean. A system is linear if its response to an input signal $u(t)=au_1(t)+bu_2(t)$ equals $y(t)=ay_1(t)+by_2(t)$, where $y_1(t)$ and $y_2(t)$ are the responses to inputs $u_1(t)$ and $u_2(t)$, respectively. The system is time-invariant if its response to $u(t-T)$ equals $y(t-T)$, where $y(t)$ is the response to $u(t)$. You specifically asked about the systems given in $d)$ and $e)$. The difference between the two systems is that system $e)$ has memory whereas system $d)$ is memoryless. The input-output relation of system $d)$ is given by $y(t)=f(u(t))$, where the function $f(u)$ is depicted in the figure. Is the condition for linearity stated above satisfied by this function? Specifically, if the input is $u(t)=a$ (referring to the constant $a$ in the figure), what is the output for the input signal $2u(t)$? Is the output scaled accordingly? 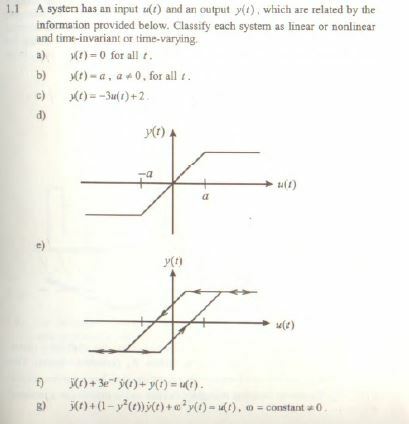 As for time-invariance, does shifting the input signal change the output signal, apart from a shift? If you can answer these questions for $d)$, the solution for system $e)$ should also be straightforward. Not the answer you're looking for? Browse other questions tagged signal-analysis linear-systems homework non-linear or ask your own question. Counter-example to show that this system is non-linear? Is blending of colour lights a linear system? Is it possible to classify biosignal data based on feature extraction through multiple linear regression model? Determine whether the system is linear?